By John Wagner, Henry Flint, Trevor Hairsine, Jason Brashill and others. With a hunger for human flesh the Dune Sharks came out of the Cursed Earth and went into a feeding frenzy on the streets of Mega-City One. 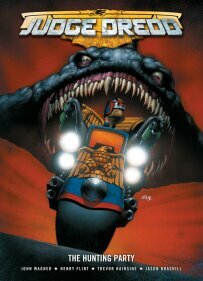 Now Dredd has gathered together a team of cadet Judges to track down the source of this alien menace. Along the way they will come face-to-face with cannibals, a rip in the fabric of time, a bizarre spider-cult, a child militia and an awesome secret going back to the days of Chief Judge McGruder! Barbarian warrior and former High King of Ireland Sláine continues the epic battle against the fearsome sea demons but now he finds an ally from an unexpected source. Together they must rid Tir Nan Og of the Fomorian scourge, using every means at their disposal including calling on help from the Earth Goddess herself! 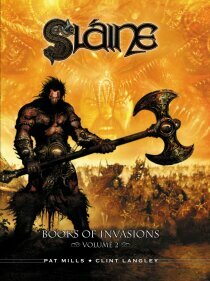 Second in Pat Mills and Clint Langley's exciting new Slaine epic, this is one Graphic Novel fantasy fans will not want to miss.